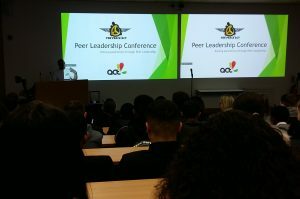 The first ever Peer Leadership Conference took place on Thursday 17th January. This programme has was led by @ACTCIC and hosted @UCBofficial. There were several guest speakers including Craig Pinkney and Naomi Donald. ACT CIC worked with students at Tudor Grange Academy, Greenwood Academy, Oldbury Academy, John Willmott School and Bristnall Hall Academy over 12 weeks. The aim was to train 50 peace ambassadors and peer educators. This training concluded with a day of inspiring and engaging presentations from the students. Well done to everyone involved!